For anyone who’s ever planned something, be it a work presentation, wedding, party for New Year’s Eve, or even a trip, well, sometimes, you just have to compromise on your expectations. Sometimes, you have this vision in your mind of exactly what you want something to be, but rarely does it ever work out that way. I know that for me, I’ve made birthday cakes for my kids – even taking cake decorating classes to learn how to decorate them well – and no matter how I envision the cake, it just doesn’t look the way I want it to. Ditto for just about everything else in life! Even going clothes shopping, I seldom seem to find that “This is precisely, completely what I wanted!” outfit. The fabric is the wrong color, the fit is just a little off, my size isn’t to be found,, well, I’m sure you’ve been there, done that too. Good thing I took home ec in 8th grade. While I don’t often make my own clothing anymore (although, on occasion I’ll make pajamas or curtains, not that I would wear curtains! ), taking that class helped teach me that not everything in life has to be bought. I remember making a simple red wrap skirt in that class, and feeling pride and accomplishment that it was actually wearable in public. Since then, I’ve taken upholstery classes so I could buy used furniture and update it to my liking, learned how to refinish furniture so I could restore antiques to their former glory, taken a landscaping course so when we gutted a historic home, we could landscape it without paying professional fees, and spent a gazillion hours on the Interwebs learning all manner of other things. Maybe all that was the precursor to the homeschooler in me, but I really love learning new skills. Especially if they help save money! 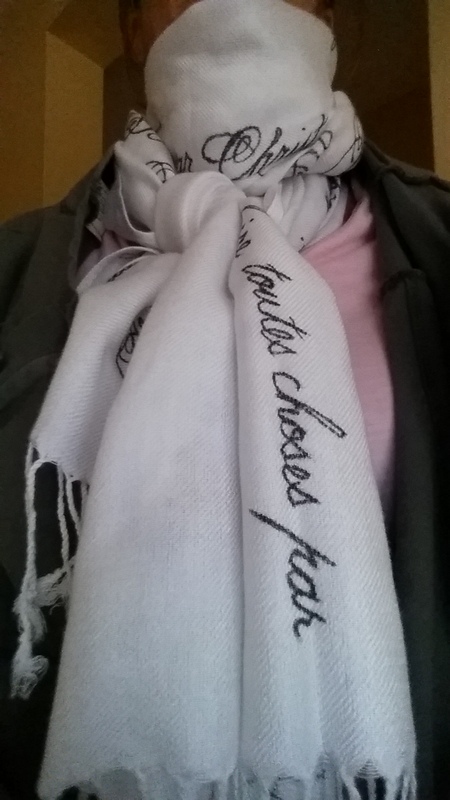 To that end, last year, I was out and about somewhere, and I saw a woman wearing an amazing scarf with “handwritten” words of a Shakespeare sonnet on it. Totally me. If anyone in my family sees there is some kind of period piece on TV (um… Call the Midwife, Downton Abbey, Shakespeare in Love, Franco Zefferelli’s Romeo & Juliet, Pride & Prejudice, North & South, Jane Eyre, War Horse; you get the picture) they Tivo it for me because I’m sort of in love with clothing & manners & eloquent speaking from the past. Especially Colin Firth as Mr. Darcy… But, I digress… I caught up with the woman and asked where she got it only to be told it had been a gift. So my BFF Google and I got together to stalk said scarf, only to learn it was nowhere to be found. I found a plain white pashmina scarf for just $7, but they have, oh so many different colors. Next time perhaps. Then I did some research to find out the best way to put permanent ink on the scarf, and found these Sharpie fabric markers at Walmart, because we love Sharpies with a passion at our house. My daughter swears she’s going to marry the Sharpie heir one day! Instead of the set, I bought black fabric markers for about $2 a piece. I used 3 for the whole project just so the ink would stay bright and crisp. It’s the verse I repeat to myself ad nauseum when life isn’t perfect. If, on the off chance someone else were to ask about the scarf, I wanted them to ASK about it. The Bible verse, I mean. So I found the French translation (because French is just such a lovely flowy-sounding language). Unless of course, I’m actually in France, then it will hold no mystery. I found the beautiful script font Before the Rain that looked like something a calligrapher might have used for an invitation to the palace, and printed it out in 72 point. This took a couple pieces of paper that I then had to cut and piece together. It was helpful to use a yardstick to keep the line level. 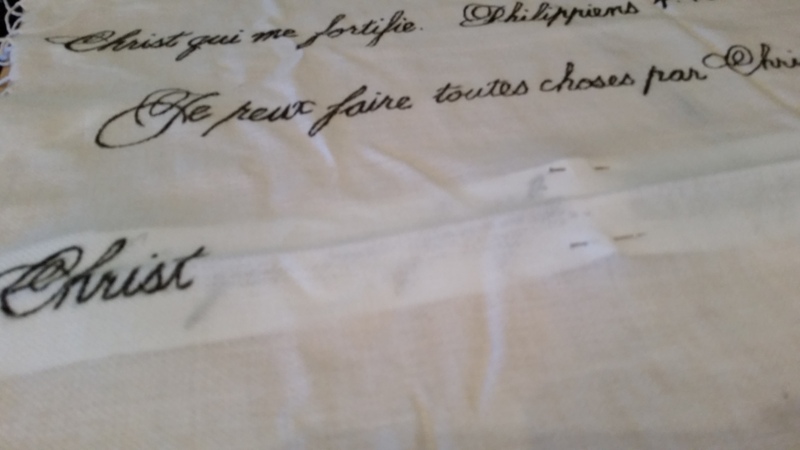 Before I began pinning the writing onto the scarf, I kind of eyeballed & measured the distance between lines of writing. I didn’t want it to be messy, but I didn’t want the words to be so far apart as to be “empty” looking either. I think I had about 2½” between each line of writing. 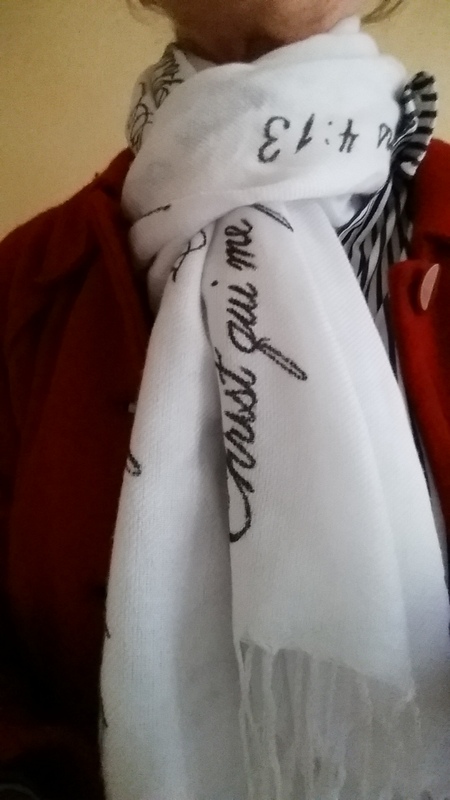 I placed the printed writing underneath the scarf, right side up. Again, I used a yardstick to help me pin the writing onto the scarf to keep the writing level. The fabric of the scarf will naturally pull a little, so having it level to begin with is important. I started the first line at the top all the way to the left. I had enough space after I wrote that line that I ended up starting the same text on the same line about 4″ after the end of the first section. I also found these decorative dingbats to put between the start of one line of verse and the next. 7. I then just alternated the remaining lines according to the above layout. 8. 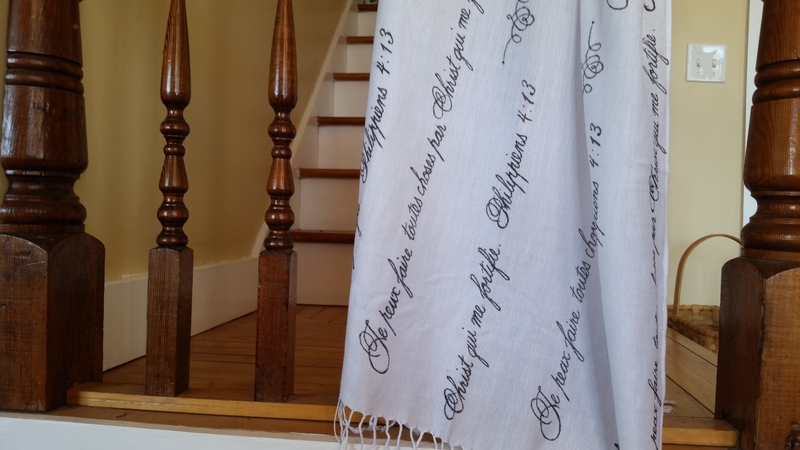 After I had finished all the lettering work, I ironed the scarf on a low setting, just enough to set the ink. You have a homemade personalized scarf with words that matter to you! I did this a little at a time, working only when the light was decent, which, wasn’t very often with this gray wintry weather, All told it took me about 3 hours from start to finish, working in starts and stops. Still, for $13 and having exactly what I wanted, well…. that’s kind of the opposite of most clothes shopping, don’t you agree? And that? Priceless! Thank you for taking the time to tell me you like it! This is so beautiful! You did a fantastic job with this! Thank you for your sweet comment. Any time I can express both creativity and my faith is a win-win. I absolutely LOVE this! Thanks for sharing the nitty gritty details on how to get it done! This would make a wonderful gift for any literary friend, of which I have many! Awww… I appreciate your kind words, and please share with me if you gift any of your bibliophile friends with something similar! I love it, too! (Are you taking online orders?) Absolutely beautiful!